Figure 1. The location of the center of mass of a multi-particle system. Find the center of mass of a hemispherical shell of constant density and inner radius r1 and outer radius r2. To find the z coordinate of the center-of-mass we divide the shell into thin slices, parallel to the xy plane. We see that the linear momentum is constant if the net external force acting on the system is 0 N. If there is an external force acting on the system, the component of the linear momentum in the direction of the net external force is not conserved, but the components in the directions perpendicular to the direction of the net external force are conserved. 1. The center of mass of a system moves as if it were a single particle with a mass equal to the total mass of the system, M, acted on by the total external force, and independent of the nature of the internal forces. 2. The linear momentum of a system of particles is the same as that of a single particle of mass M, located at the position of the center of mass, and moving in the manner the center of mass is moving. 3. The total linear momentum for a system free of external forces is constant and equal to the linear momentum of the center of mass. 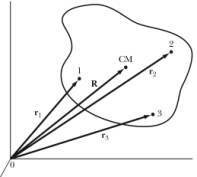 Consider a system of particles that are distributed as shown in Figure 2. We can specify the location of the center of mass of this system by specifying the vector R. This position vector may be time dependent. The location of each component of this system can be specified by either specifying the position vector, ra, with respect to the origin of the coordinate system, or by specifying the position of the component with respect to the center of mass, ra'. Figure 2. Coordinate system used to describe a system of particles. The angular momentum is thus equal to sum of the angular momentum of the center of mass and the angular momentum of the system with respect to the center of mass. 1. The total angular momentum about an origin is the sum of the angular momentum of the center of mass about that origin and the angular momentum of the system about the position of the center of mass. 2. If the net resultant torques about a given axis vanish, then the total angular momentum of the system about that axis remained constant in time. 3. The total internal torque must vanish if the internal forces are central, and the angular momentum of an isolated system can not be altered without the application of external forces. Even though the total force on a system of particles is zero, the net torque may not be zero. Show that the net torque has the same value in any coordinate system. The problem states that the total force is equal to zero. The total energy of a system of particles is equal to the sum of the kinetic and the potential energy. We thus see that the total energy is conserved. If the system of particles is a rigid object, the components of the system will retain their relative positions, and the internal potential energy of the system will remain constant. 1. The total kinetic energy of the system is equal to the sum of the kinetic energy of a particle of mass M moving with the velocity of the center of mass and the kinetic energy of the motion of the individual particles relative to the center of mass. 2. The total energy for a conservative system is constant. A flexible rope of length 1.0 m slides from a frictionless table top as shown in Figure 3. The rope is initially released from rest with 30 cm hanging over the edge of the table. Find the time at which the left end of the rope reaches the edge of the table. This of course should be no surprise since when we consider both particles, the interaction force becomes an internal force and in the absence of external forces, linear momentum will be conserved. The conservation of linear momentum is an important conservation law that restricts the possible outcomes of a collision. No matter what the nature of the collision is, if the initial linear momentum is non-zero, the final linear momentum will also be non-zero, and the system can not be brought to rest as a result of the collision. If the system is at rest after the collision, its linear momentum is zero, and the initial linear momentum must therefore also be equal to zero. Note that a zero linear momentum does not imply that all components of the system will be at rest; it only requires that the two object have linear momenta that are equal in magnitude but directed in opposite directions. The most convenient way to look at the collisions is in the center-of-mass frame. In the center-of-mass frame, the total linear momentum is equal to zero, and the objects will always travel in a co-linear fashion. This illustrated in Figure 4. Figure 4. 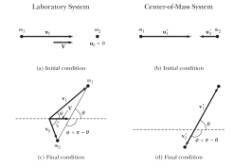 Two-dimensional collisions in the laboratory frame (left) and the center-of-mass frame (right). · Elastic collisions: collisions in which the total kinetic energy of the system is conserved. The kinetic energy of the objects will change as a result of the interaction, but the total kinetic energy will remain constant. The kinetic energy of one of the objects in general is a function of the masses of the two objects and the scattering angle. o Q = 0: elastic collision (kinetic energy is conserved). In most inelastic collisions, a fraction of the initial kinetic energy is transformed into internal energy (for example in the form of heat, deformation, etc.). where u are the velocities after the collision and v are the velocities before the collision. For a perfect elastic collision e = 1 and for a totally inelastic collision e = 0. One important issue we need to address when we focus on collisions is the issue of predictability. Let's consider what we know and what we need to know; we will assume that we looking at a collision in the center-of-mass frame. Let's define the x axis to be the axis parallel to the direction of motion of the incident objects, and let's assume that the masses of the objects do not change. The unknown parameters are the velocities of the object; for the n-dimensional case, there will be 2n unknown. What do we know? · Conservation of linear momentum: this conservation law provides us with n equations with 2n unknown. · Conservation of energy: if the collision is elastic, this conservation law will provide us with 1 equation with 2n unknown. For elastic collisions we thus have n+1 equations with 2n unknown. We immediately see that only for n = 1 the final state is uniquely defined. For inelastic collisions we have n equations with 2n unknown and we conclude that event for n = 1 the final state is undefined. When the final state is undefined we need to know something about some of the final-state parameters to fix the others. By measuring the final kinetic energy we can thus determine the target mass. Note: we need to make sure that the object we detect at 90° is the projectile. An example of an application of this is shown in Figure 5. Figure 5. Energy spectrum of the scattered projectiles at 90°. We have learned a lot of properties of atoms and nuclei using elastic scattering of projectiles to probe the properties of the target elements. A schematic of the scattering process is shown in Figure 6. In this Figure, the incident particle is deflected (repelled) by the target particle. This situation will arise when we consider the scattering of positively charged nuclei. Figure 6. Scattering of projectile nuclei from target nuclei. The parameter b is called the impact parameter. The impact parameter is related to the angular momentum of the projectile with respect to the target nucleus. Figure 7. Correlation between impact parameter and scattering angle. We conclude that the intensity of scattered projectile nuclei will decrease when the scattering angle increases. If the energy of projectile nuclei is low enough, the measured angular distribution will agree with the so-called Rutherford distribution over the entire angular range, as was first shown by Geiger and Marsden in 1913 (see Figure 8 left). 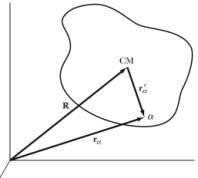 Each trajectory of the projectile can be characterized by distance of closest approach and there is a one-to-one correspondence between the scattering angle and this distance of closest approach. The smallest distance of closest approach occurs when the projectile is scattered backwards (q = 180°). 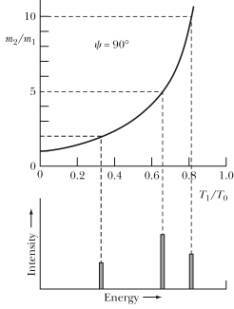 The distance of closest approach decreases with increasing incident energy and the Rutherford formula indicates that the intensity should decrease as 1/T2. 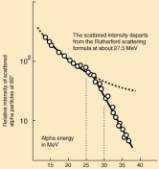 This was indeed observed, up to a maximum incident energy, beyond which the intensity dropped of much more rapidly than predicted by the Rutherford formula (see Figure 8 right). At this point, the nuclei approach each other so close that the strong attractive nuclear force starts to play a role, and the scattering is no longer elastic (the projectile nuclei may for example merge with the target nuclei). Figure 8. Measurement of the scattering of alpha particles from target nuclei. Figures taken from http://hyperphysics.phy-astr.gsu.edu/hbase/nuclear/rutsca2.html. 2) The forces exerted between any two particles are directed parallel or anti-parallel to the line joining the two particles. These two requirements are fulfilled for many forces. 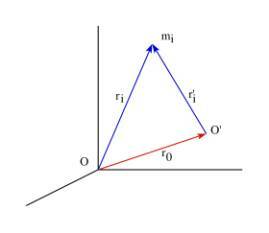 However, there are important forces, such as the magnetic force, do not satisfy the second assumption..